We no longer carry products from this brand. Please consider a similar product from one of our recommended brands. 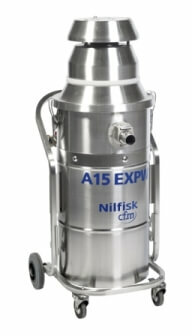 Nilfisk industrial vacuums, including the CFM A15 EXPW, help boost productivity and save valuable man-hours. The Nilfisk CFM A15 EXPW is an air-operated, intrinsically safe vacuum that meets the requirements for use in Class I, Group D, and Class II, Groups E*, F, and G. It is designed for the collection of wet materials. (The A15 EXP is another version of the machine designed for dry material collection). The vacuum is made of 304 stainless steel and features optional HEPA or ULPA filtration. *Collection of commercial alloys is subject to individual approval by our application engineer. Only Nilfisk industrial vacuums, including the Nilfisk CFM A15 EXPW, help boost productivity and save valuable man-hours. These machines are specifically designed to deliver a fast, thorough cleaning, which enables you to get the job done right the very first time you do it. These machines can quickly collect huge quantities of dirt, debris, hazardous materials, or whatever else your facility can produce, with very little maintenance required. They are built ruggedly to survive even the toughest conditions, and with these vacuums on your side, you will notice a marked improvement in efficiency. Specifically, Nilfisk vacuums feature explosion and static protection, which will reduce your risk when collecting explosion-hazard materials; efficient bulk collection; simple waste disposal; improved air quality due to advanced filtration systems; anti-clogging filtration to maximize suction power and eliminate clogging; user-friendly features to maximize user comfort and reduce fatigue; easy-to-clean design for quick cleanup in even the toughest of plant environments. Non-sparking, conductive accessories are available to meet a wide range of cleaning needs.